I was fortunate enough to make my first trip to Chattanooga yesterday, to see the Lookouts play against the Birmingham Barons. It was a blazing hot afternoon, and the one bad thing about BellSouth Park is that there is very little shade. So we roasted all afternoon, until the sun went behind a cloud to stay during the eighth inning. The park was nice, if not the best minor league ballpark I’ve been to, and the game was a lot of fun. The Lookouts put on a nice offensive display, with Kevin Howard’s grand slam capping a seven-run fifth inning. Jeffrey Bruksch started on the mound and had a pretty good game, though I wasn’t very impressed with either his fastball or his command. For what it’s worth, I also attended the Braves-Pirates game at Turner Field on Saturday night. It was my first chance to visit Turner Field, and I was impressed. Nice facility. Best of all, the Braves also enjoyed a seven run inning…that’s two in two days. Nice weekend baseball road trip. 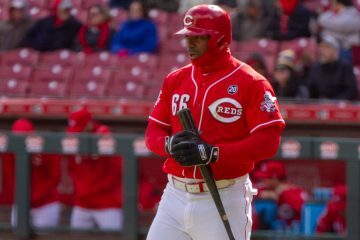 So what is the nice minor league park that you have been to? The nicest minor league park…hmmm, that’s a tough call. Durham’s stadium is very nice. It’s probably the best I’ve seen, but I also like Louisville’s Slugger Field. Norfolk, Va.’s Harbor Park is nice, as is Smokies Park in Sevierville, TN. Best Major League park? I’d say Camden Yards in Baltimore. I love PNC Park in Pittsburgh. Brand-new Petco in San Diego looks very good too, but haven’t been there. AAA – I did like Norfolk’s pretty well. Was there just after it was fully completed. 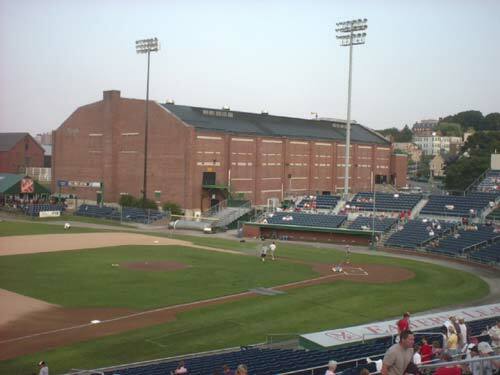 AA – I’ve only been to one current AA stadium, home of the Portland Sea Dogs, Hadlock Field. My local park used to be AA, more in a moment. A – Haven’t been to many A-level parks besides my own town’s; most are not much to look at. I would love to go see the Brooklyn Cyclones’ home, Keyspan Park. A special award for my local park, Centennial Field, which currently houses the only remaining “Expos” as well as the University of Vermont Catamounts. Nice park, great atmosphere, stands always packed, but be sure to bring a seat cushion for the unmarked concrete bleachers. Centennial once was home to Ken Griffey Jr. as he rocketed through the Mariners’ system in ’88 (got his autograph). And best of all, for four years before that was home of the Vermont Reds. Chris Sabo, Joe Oliver, Paul O’Neill, Barry Larkin, Rob Dibble, Norm Charlton, and a whole host of others came through Burlington VT.
I’ve been to Camden Yards twice. Next time I’m eating at Boog’s! Since you left the door cracked open, now everyone has to scroll past my Turner Field rant. This place is absolutely the worst of the 90s ballparks (and I’ve been to nearly all of them). It’s nice enough walking up from the outside but upon entering, the first thing you see is . . . not the glistening emerald field or even a stately tribute to Hank Aaron or Dale Murphy but rather the Time Warner Cartoon Network kids village to your left, the crap/gift shop straight ahead, and the test your pitch speed, win a free AC/DC mirror festival booth to your right. Crane your neck around all of this and you might begin to realize that you’ve entered a place where baseball is played. This place is tacky as hell and appeals to the lowest common denominator for everything. There’s a bar AND a restaurant. There might even be an Applebees tucked away in some corner that I missed. Of course it’s louder than bombs in between every inning but the worst is the new 8 storie jumbo-idiot-tron which nearly compels you to watch it instead of the game in front of your very eyes. And yet you can’t argue with the product on the field I s’pose. Makes me appreciate the GAB all the more though. When I said “best of all,” I just meant that we got to see two straight games with seven run innings. 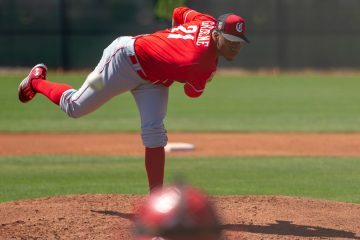 Anyway, I was cheering for the Braves, since the Reds and Pirates are fighting for the bottom of the Central division!